Fans of blackberries are surely enjoying the summer when the plant matures and bears delicious dark coloured berries. Blackberry wine is an excellent antioxidant, strengthens the immune system and prevents cardiovascular disorders. In a word blackberry is an outstanding medicine from nature. In addition it can be consumed as fresh fruit, it is possible to find the products, in the form of the juice, jam, tea, but blackberry wine is the most popular. It has long been known as a remedy which our ancestors used against anaemia, it is good for children, and recommended in the nutrition of pregnant women and women who are in the climax, and as such is used to this day. Below you will get more familiar with this plant, its properties, and how to make the famous homemade blackberry wine. Since it is much more sensitive to cold than is the case with raspberries, blackberry plant thrives in areas where the warmer climate prevails, so it is especially noticeable in the southern regions of Europe. Since it needs a greater amount of moisture during the growing season, it is necessary to ensure regular watering, avoiding damage that results from prolonged drought that are most common in July and August when otherwise the plant matures. The cultivated plants give the best yields. What is characteristic of blackberry is that the period of maturity is not simultaneous, which means that they have a longer period of harvest, which can last up to a month. Often, this period lasts longer, especially in certain hybrid varieties of the plant from which the famous blackberry wine is made. Blackberry plant has spread throughout the southern Europe and it grows as a shrub that reaches a height of about 1.70 meters. Blackberries are very tasty, but also curative, because they represent a rich source of natural antioxidants. In addition, they also have anti-cancer properties and prevent diseases of the heart and blood vessels, making it one of the best medicines against these diseases. The blackberry fruit is very rich in potassium, iron and magnesium, and contains vitamins C and E. These substances and antioxidants, which are abundant it this fruit, are very effective in the prevention of many diseases. Why are blackberries good for your health? They contain lutein, which is extremely nutritious and beneficial to the human eye, and reduces the risk of eye diseases such as cataracts, and is significant because it absorbs harmful UV rays and thus acts as a filter for the sunlight. In addition to the above mentioned health benefits that this fresh fruit and homemade blackberry wine gives us, it was found that tea from the leaves of blackberry has a lot of healing properties. Namely, it is scientifically proven that regular consumption of this drink helps in relieving and preventing symptoms of diarrhoea, soothes hemorrhoids and helps with the recovery, and also it helps with the inflammation of the respiratory system. Rinsing the mouth with this beverage prevents the occurrence of periodontal disease and bleeding gums. If you are willing to make this tea, it is recommended that leaves of a wild blackberry are picked in the spring, in May and June. On the other hand, homemade blackberry juice is very effective and is recommended for people who have problems with the digestive system, especially those who have symptoms of the so-called lazy bowel, because the juice helps with digestion. It is most commonly given to children who have these health problems, but also because it is a great source of natural fruit sugar and the organism receives the required energy for the whole day. It is also recommended to athletes, especially after training because it relieves the symptoms of fatigue. It also represents a true natural elixir for the liver and helps its proper function. As a very popular, useful and efficient beverage, homemade blackberry wine has been used as a natural medicine to treat many diseases for a very long time. 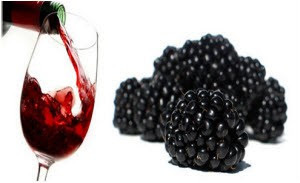 Blackberry wine has proved to be an extraordinary remedy against cholesterol, because its moderate consumption provides the necessary intake of materials that provide ideal protection of the heart and blood vessels against chronic diseases. This stimulates an increase in levels of lipoproteins in the blood, or the so-called "good" cholesterol that eliminates unhealthy cholesterol. It is mostly recommended to the elderly and to those with an inborn high risk of getting heart disease, just because they can have the greatest benefit from the consumption of blackberry wine. The most frequently mentioned and recommended it the blackberry wine for anaemia, or people suffering from a lack of iron in the blood. They are advised to drink 1 decilitre of beverage a day before lunch. This beverage will provide the body great amounts of iron, vitamins C and B and folic acid and thus will improve the health. Blackberry wine can be consumed during pregnancy. It has a very sweet and pleasant taste and is recommended to be consumed by healthy people as well. It is especially useful for pregnant and lactating women. It is interesting that in France children drink this wine diluted with water, and it is known that residents of this country have the lowest rates of heart and brain diseases in Europe. During pregnancy, due to the growth of the fetus, there is a problem with the blood count and hemoglobin levels. It is therefore advisable that blackberry wine is drunk by pregnant women, especially those who normally suffer from anaemia and chronic fatigue. This beverage will increase the level of iron in the blood. Scientific studies published in the Journal of Food Science found that blackberry wine is rich in many beneficial substances that are favourable to our health and vitality. Specifically, it was found that wine contains resveratrol blackberry, an extremely efficient and powerful antioxidant that effectively reduces cholesterol in the blood, and also regulates blood clotting and reduces the risk of a heart attack. Also, the researchers found that this natural phenol lowers blood sugar levels, so drinking blackberry wine is recommended for people with diabetes. Medical research indicates that the blackberry wine is a cure for colon cancer. People who drink this beverage reduce the risk of getting a dangerous malignant disease by as much as 45 percent! Since it increases the secretion of estrogen and contains high levels of manganese, blackberry wine is a great ally in the prevention of osteoporosis. In particular, it is advised to people over the age of 50, as it strengthens bones and prevents fractures and helps the healing after fractures. Blackberry wine is a true natural elixir for health and as such is a beverage that ensures vitality and contributes to improving the general state of human health. Scientists in the analyzes carried out in 2007 found that people who consume blackberry wine have a 34 percent lower mortality rate compared to those who consumed the grape wine or beer. In addition, it is evident that those who drink this beverage are far less likely to suffer from a variety of neurological disorders such as Alzheimer's and Parkinson's disease, and it significantly reduces the risk of experiencing a stroke. The treatment of using this beverage helps promote better memory and cognitive function, reduces distractions and makes it easier to maintain concentration. Results of the research also shows that blackberry wine reduces the risk of developing cataracts by 32 percent, so it is recommended by ophthalmologists also. To make a Blackberry wine is easy and convenient. You need to get fresh berries, the best ones directly from the manufacturer or to search for vendors in the market. If you cannot find fresh ones, you can buy frozen which are available throughout the year. How much wine you want to create directly depends on the amount of blackberries that you purchase. In addition, it is necessary to obtain sugar, which should be 20 percent of the amount of purchased fruit. It is recommended that you initially get 10 kilos of fruit and 2 kilograms of sugar. If you estimate that blackberries you have acquired are sweeter than usual you can reduce the amount of sugar. Here are two ways to make blackberry wine. Put the fresh blackberries into a larger container or barrel which was previously cleaned and mash them well in order for them to release their juice until you get a pasty mixture. Add sugar and mix until everything is fully united. After that, pour the blackberry wine into cleaned glass bottles and do not close them all the way, in order for wine not boil over during the fermentation. Leave these bottles in the sun for 60 days, after that you can consume the beverage. Afterwards close the bottles and store them in a cool place. With this type of preparation it is not necessary to crush the berries but to clean them first and then arrange them in the barrel by placing one line of fruit then sprinkle it with sugar and to keep going until you have used up all 10 kilograms of blackberries and 2 kilograms of sugar. Then, cover the barrel with gauze or cloth and leave it in a place where the temperature is moderate to stand for two to three weeks. After that, you'll notice that some blackberries have surfaced and it is necessary to remove them. The juice contained in a barrel needs to be filtered through cheesecloth and poured into clean jars and after that it should stand for another week. During this period, you will notice that the juice in a jar is deposited on the bottom and that clean wine is on the surface. After one week, carefully filter it through a double cheesecloth wine to prevent it from mixing with aforementioned sludge and pour it into clean glass bottles, where you need to tie the top of bottles with gauze and place them in a cool place. After three weeks the blackberry wine is ready for use, after which you can close the bottle caps. The residue that is left in the jars can be mixed with fresh blueberries and placed in a warm place, allowing you to get a home blackberry vinegar that you can use as a food additive, and it is also extremely healthy and beneficial for the heart and circulation. Once made the blackberry wine has an unlimited shelf life. It is recommended to be used cold at a temperature of 16 degrees, because only then it has a perfect taste. It is advisable to occasionally drink one glass of blackberry wine, but it should be noted that overdose can have a bad or even opposite effect. Excessive use of any alcoholic beverage may contribute to deterioration in the overall health status, and in particular may cause the development of heart disease, high blood pressure, obesity and liver damage. People, who cannot keep their liquor, can drink blackberry wine diluted with water in the ratio 1:1, or to replace it with fresh blackberries or jams, marmalade and tea from blackberry leaves. The daily dose that is recommended to all persons is 1 decilitre of it half an hour before meals. If you prefer, you can drink in the morning on an empty stomach or at bedtime. After one month of its consumption signs of improvement in general health will start to show, and people suffering from anaemia are recommended to drink blackberry wine for blood for at least 2 months. Those with chronic illnesses should use the treatment for at least 3 months, after which they need to check their blood count. What is the price in stores and where to get it? Blackberry wine is slightly more expensive than other wines which are made from grapes, and it can be found in almost all markets. The price is around 10 dollars for a bottle of 1 litre, depending on the manufacturer and seller. It is highly recommended that you buy an organic product, which can be purchased from cultivators themselves, wineries, and in markets and health food stores. If you cannot find homemade blackberry wine, you can use one of two recipes we recommend you and you will be satisfied with the results.